Abstract: Despite recent advances in both diagnosis and prevention, the incidence of invasive fungal infections continues to rise. Available antifungal agents to treat invasive fungal infections include polyenes, triazoles, and echinocandins. Unfortunately, individual agents within each class may be limited by spectrum of activity, resistance, lack of oral formulations, significant adverse event profiles, substantial drug–drug interactions, and/or variable pharmacokinetic profiles. Isavuconazole, a second-generation triazole, was approved by the US Food and Drug Administration in March 2015 and the European Medicines Agency in July 2015 for the treatment of adults with invasive aspergillosis (IA) or mucormycosis. Similar to amphotericin B and posaconazole, isavuconazole exhibits a broad spectrum of in vitro activity against yeasts, dimorphic fungi, and molds. Isavuconazole is available in both oral and intravenous formulations, exhibits a favorable safety profile (notably the absence of QTc prolongation), and reduced drug–drug interactions (relative to voriconazole). Phase 3 studies have evaluated the efficacy of isavuconazole in the management of IA, mucormycosis, and invasive candidiasis. Based on the results of these studies, isavuconazole appears to be a viable treatment option for patients with IA as well as those patients with mucormycosis who are not able to tolerate or fail amphotericin B or posaconazole therapy. In contrast, evidence of isavuconazole for invasive candidiasis (relative to comparator agents such as echinocandins) is not as robust. Therefore, isavuconazole use for invasive candidiasis may initially be reserved as a step-down oral option in those patients who cannot receive other azoles due to tolerability or spectrum of activity limitations. Post-marketing surveillance of isavuconazole will be important to better understand the safety and efficacy of this agent, as well as to better define the need for isavuconazole serum concentration monitoring. Available antifungal agents to treat IFIs include polyenes, triazoles, and echinocandins. For years, amphotericin B (a polyene) was the treatment of choice for serious, life-threatening IFIs. However, given its significant adverse event profile (most notably nephrotoxicity, infusion reactions, and electrolyte disturbances), its use has declined given the availability of safer alternatives in select infections.9 Despite these limitations, lipid-based formulations of amphotericin B have remained the treatment of choice for select IFIs. This includes mucormycosis, due (in part) to the lack of in vitro activity of most antifungals against these pathogens.7 Since the 1990s, triazoles have provided an alternative to amphotericin B for treatment of many IFIs. Fluconazole represents a viable treatment option for many susceptible Candida spp. ; however, widespread use as empiric therapy for all forms of invasive candidiasis has recently been limited by the emergence of azole-resistant spp.4 Voriconazole replaced amphotericin B as the preferred therapy for IA.10 However, adverse events, drug–drug interactions, and both inter- and intra-patient pharmacokinetic variability (resulting in the need for serum concentration monitoring) complicate its use.9 Unlike other triazoles, posaconazole is often used in sequence after amphotericin B therapy in patients with mucormycosis or as primary therapy in patients unable to tolerate amphotericin B.7 Limited clinical experience with posaconazole in these patient populations, along with the caution against using the intravenous (IV) formulation in patients with a creatinine clearance (CrCl) <50 mL/min, have been barriers to its widespread use. The echinocandins (caspofungin, micafungin, and anidulafungin) were introduced in the mid-2000s, and have most often been used to treat invasive candidiasis and refractory IA.4,11 Despite widespread use of the echinocandins over the past decade, they are limited by their lack of oral formulations and absence of activity in vitro against Mucormycetes. Isavuconazonium sulfate (Cresemba; Astellas Pharma US, Inc.; Northbrook, IL, USA) is a second-generation triazole approved by the US Food and Drug Administration (FDA) in March 2015 and the European Medicines Agency in July 2015. Isavuconazonium sulfate is the prodrug of isavuconazole (the active moiety), thus the latter terminology will be used throughout this review (except where noted). Isavuconazole exhibits a broad spectrum of activity in vitro against yeasts, dimorphic fungi, and molds (notably Aspergillus spp. and Mucormycetes).12 Available in both oral and IV formulations, isavuconazole currently has approved indications for the treatment of adults with IA and mucormycosis.12 The primary aim of this review is to summarize the pharmacologic, kinetic, clinical efficacy and safety characteristics of isavuconazole which best help define its potential role in the management of IFIs. Similar to other azoles, isavuconazole inhibits the CYP450-dependent enzyme lanosterol 14-alpha-demethylase, encoded by the gene ERG11. This enzyme is responsible for producing essential fungal cell wall components through conversion of lanosterol to ergosterol.12,13 As a result, fungal cell membrane fluidity and asymmetry are compromised. This leads to membrane dysfunction and arrested fungal growth. Notes: *Concentration in mcg/mL; –, data not reported. Abbreviations: n, number; MIC50, minimum inhibitory concentration for 50% of isolates; MIC90, minimum inhibitory concentration for 90% of isolates. Isavuconazole is active in vitro against common Aspergillus spp., including Aspergillus fumigatus and Aspergillus flavus with an MIC90 of 1 mcg/mL for both organisms (using CLSI methods).14,16 Aspergillus niger exhibits reduced susceptibility to isavuconazole, with an MIC90 of 4 mcg/mL. Overall, isavuconazole MICs for Aspergillus spp. are comparable to the activity of both voriconazole (0.5 mcg/mL) and posaconazole (0.5 mcg/mL). Several studies have evaluated the activity of isavuconazole vs non-Aspergillus molds, specifically the Mucormycetes. A study which included Mucormycetes isolates (n=72) compared the in vitro activity of isavuconazole against amphotericin B, voriconazole, and posaconazole.17 Using the European Committee on Antimicrobial Susceptibility Testing and CLSI testing methodologies, isavuconazole MIC50 ranged from 1–4 mcg/mL for isolates of Mucormycetes. However, some species (such as Mucor circinelloides) displayed reduced susceptibility, with the MIC50 ranging from 4–16 mcg/mL. 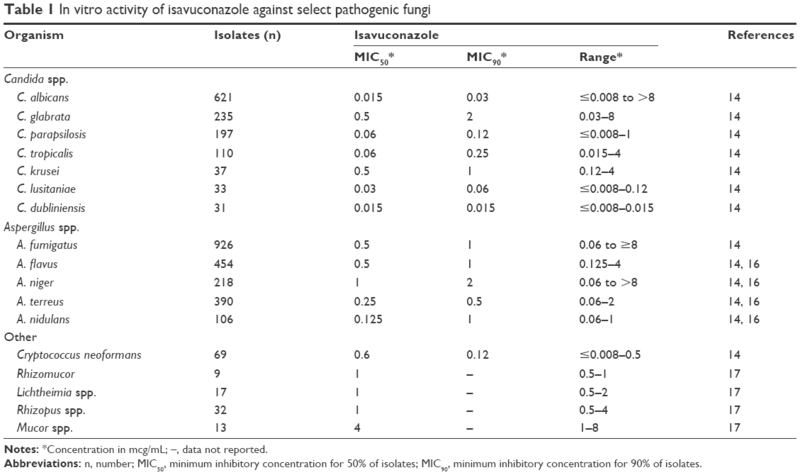 While isavuconazole exhibits higher MIC50 values than posaconazole (MIC50 ranged from 0.25–1 mcg/mL) against Mucormycetes isolates, the lack of defined breakpoints for these organisms makes the clinical significance of this finding uncertain. The pharmacodynamics of isavuconazole have been evaluated in murine models of disseminated candidiasis and aspergillosis infections.20–23 In vivo murine invasive candidiasis models reported that the 24-hour free-drug area under the time-concentration curve (AUC) over the MIC was most predictive of isavuconazole efficacy (R2, 0.84).22 Of note was the observation that isavuconazole AUC/MIC values associated with efficacy were significantly lower for the C. glabrata and Candida tropicalis isolates compared to C. albicans (P=0.04). A similar study evaluated the pharmacodynamic target of isavuconazole in IA.21 Fifty percent survival was attained with an AUC/MIC ratio of 24.73 (95% confidence interval [CI], 22.50 to 27.18). As expected, isavuconazole was ineffective at improving survival in isolates harboring azole resistance genes and elevated MIC values. Isavuconazole is commercially available as the prodrug isavuconazonium sulfate.12 The active moiety (isavuconazole) is rapidly produced through hydrolysis by plasma esterases. Animal model and human studies have described a high oral bioavailability of isavuconazole (98%) (see Table 2). The oral absorption is not significantly affected by food, enabling isavuconazole to be taken without regard to meals. Single dose studies of IV (50, 100, or 200 mg) and oral (100, 200, 400 mg) isavuconazole demonstrated peak plasma concentrations (Cmax) of 2–2.5 mcg/mL achieved at the end of the 1-hour infusion and 1.5 to 3 hours after oral administration.24 While disproportionate increases in plasma AUC and Cmax concentrations raised the possibility of non-linear drug exposure and saturable metabolism, this was not observed in subsequent pharmacokinetic studies.24,25 In multidose studies, isavuconazole steady-state concentrations were not reached until approximately 2 weeks of once-daily dosing. There was significant (3–5-fold) drug accumulation from study day 1 to study day 14. However, the Cmax and AUC values were proportional for the 50 mg and 100 mg daily doses (indicating that isavuconazole follows nonsaturable linear elimination).25 Isavuconazole is extensively protein bound (99%) similar to posaconazole and widely distributed (volume of distribution 155–494 L) which is consistent with other azole antifungals.24 Isavuconazole primarily undergoes hepatic metabolism through CYP3A4 and subsequently UGTs, with only 0.02%–0.38% of unchanged drug being recovered in urine.12 Elimination is biphasic, with a half-life of 0.42–2 hours and 56–104 hours in the distribution and terminal elimination phases, respectively.24 The prolonged half-life of isavuconazole compared to other azole antifungals allows for once-daily maintenance dosing. Notes: aDecreased when administered with food; boral tablets have higher bioavailability than oral suspension. The pharmacokinetic profile of isavuconazole has been reported in special populations, including hepatic impairment, renal impairment, and geriatrics. The increased water solubility of the isavuconazole prodrug (isavuconazonium sulfate) facilitates formation of a solution without addition of a cyclodextrin which limits the use of IV voriconazole and posaconazole due to the risk of renal toxicity in patients with a CrCl <50 mL/min. Due to the lack of cyclodextrin and minimal renal excretion, isavuconazole can be given to patients with mild, moderate, and severe renal impairment without need for dose adjustment. Patients with mild to moderate hepatic impairment (Child-Pugh Class A or B) exhibit decreases in clearance (40% and 48%, respectively), but such reductions do not warrant dose reduction in these patients.26,27 Currently, there are no data in patients with severe hepatic impairment (Child-Pugh Class C).12 No published data exist which report the pharmacokinetics of isavuconazole in pediatric patients. AUC does not change significantly in elderly males (>65 years of age); however there are slight increases for elderly females when compared to elderly males and younger females (AUC increase 38% and 47%, respectively). Nevertheless, these increases were not considered significant enough to warrant dose modification.12 Finally, the pharmacokinetics of isavuconazole were assessed in a pharmacokinetic model between healthy Western and Chinese subjects.12 Compared to Western subjects, Chinese subjects had a 40% lower clearance of isavuconazole. Despite the reduction in clearance, there is no formal dose adjustments for Chinese patients. The safety and efficacy of oral isavuconazole for the treatment of uncomplicated esophageal candidiasis was evaluated in a Phase 2, randomized, double-blind, parallel group, noninferiority study at eight sites in South Africa.28 Adults 18–65 years of age were randomized (1:1:1:1) to receive one of the following once-daily oral regimens for a minimum of 14 days: isavuconazole 200 mg on day 1 followed by 50 mg from day 2 to the end-of-therapy (EOT); isavuconazole 400 mg on days 1, 7, 14, and 21; isavuconazole 400 mg on day 1, followed by 100 mg from day 2 to the EOT; or fluconazole 200 mg on day 1, followed by 100 mg from day 2 to the EOT. Approximately one third of study patients had HIV infection. C. albicans was isolated in 96.6% of cases, followed by C. glabrata (2.8%) and C. tropicalis (0.7%). Endoscopically-confirmed clinical response at the EOT was observed in 146 (95.4%) patients, and was similar between treatment groups. Overall, each dosing regimen of isavuconazole demonstrated noninferiority (within a margin of 15%) to fluconazole. Of note, the dose of fluconazole used in this study is lower than the dose currently recommended by the Infectious Diseases Society of America for this indication.4 In addition, patients with recurrent or refractory disease and those having failed prior antifungal therapy were excluded from this trial, which represent a large portion of patients in need of well-tolerated alternatives with oral dosage formulations. The safety and efficacy of isavuconazole for primary or salvage treatment of IA in patients with renal impairment and for rare IFIs, including mucormycosis was evaluated in a Phase 3, single-arm, open-label, multicenter, noncomparative trial.35 Adult patients with renal impairment and proven, probable, or possible IA were included. Additionally, patients with culture-confirmed IFIs caused by rare molds, including Mucormycetes were eligible. Included patients received isavuconazole 200 mg IV or orally every 8 hours for six doses, followed by 200 mg daily for up to 180 days or longer in patients with clinical benefit. Of the 149 patients enrolled, 37 had proven (86%) or probable (14%) mucormycosis only; the majority of which were lower respiratory tract infections (59.4%) with or without other organ involvement. Pathogens causing mucormycosis included Mucorales not otherwise specified (35%), Rhizopus oryzae (19%), Mucor spp. (16%), and Rhizomucor spp. (14%). The median duration of treatment was 84 days (interquartile range 19–179, range 2–882). Overall, eleven (31.4%) patients had a successful response at EOT. All-cause mortality at days 42 and 84 were 38% and 43%, respectively, which is similar to published data on amphotericin B and posaconazole oral solution in immunocompromised hosts.36–38 Patients receiving isavuconazole for primary treatment had a lower mortality through day 42 compared with those receiving salvage therapy for refractory disease or those intolerant to other antifungals (33.3%, 45.5%, and 40%, respectively). To further define the clinical efficacy of isavuconazole, a case-control analysis was reported in which patients with mucormycosis who received primary treatment with isavuconazole were compared to contemporary controls from the FungiScope registry who received amphotericin B followed by posaconazole.35 The crude (33% vs 39%, P=0.775) and weighted all-cause mortality at day 42 (33% vs 41%, P=0.595) and survival at day 84 (57% vs 50%, P=0.653) did not differ for patients treated with either isavuconazole or amphotericin B formulations, respectively. Clinically significant or commonly associated adverse effects with triazoles include gastrointestinal (nausea, vomiting, hepatic enzyme elevations) and cardiovascular (QTc prolongation) effects.9 However, the severity and incidence to which these occur vary between the different triazoles. In general, isavuconazole is well-tolerated and appears to have a similar safety profile to that of fluconazole.39 In Phase 1 and 2 studies, no serious adverse effects occurred due to isavuconazole.24,25,28 Furthermore, in Phase 3 clinical trials, isavuconazole appears to have a more favorable safety profile compared to that of voriconazole and a comparable safety profile to that of caspofungin.30,32,35 The most frequently reported adverse events were gastrointestinal disorders (nausea [26%], vomiting [25%], diarrhea [22%], constipation [13%], elevated liver enzymes [16%]), headache (17%), hypokalemia (14%), dyspnea (12%), cough (12%), peripheral edema (11%), and back pain (10%). In the SECURE study, isavuconazole-treated patients had significantly fewer hepatobiliary disorders (9% vs 16%; P=0.016), skin and subcutaneous tissue disorders (33% vs 42%; P=0.037), and eye disorders (15% vs 27%; P=0.002) compared to voriconazole-treated patients.32 In addition, significantly fewer patients reported treatment-emergent adverse events considered drug-related by investigators with isavuconazole compared to voriconazole (42% vs 60%; P<0.001). Drug discontinuation due to either treatment-emergent or drug-related adverse events was less common with isavuconazole compared to voriconazole (14% vs 23% and 8% vs 14%, respectively).32 However, the increased number of adverse events and drug discontinuations in the voriconazole group may be attributable (at least in part) to the inability to monitor voriconazole serum concentrations. The frequency of treatment-emergent (94.6%) and study-drug related (35.1%) adverse events in patients treated for invasive mucormycosis in the VITAL study were similar to the SECURE study.35 The most common treatment-emergent adverse events were nausea, vomiting, diarrhea, and pyrexia. The triazoles have a significant number of drug–drug interactions, especially with itraconazole and voriconazole.9 These interactions are facilitated primarily through their variable inhibition of the cytochrome P450 system (most notably CYP3A4).43 Isavuconazole’s interaction profile most closely resembles that of posaconazole, and appears to have less drug interactions than voriconazole.39,40 Specifically, in vitro studies have shown isavuconazole to be a substrate of both CYP3A4 and CYP3A5, inhibitor of CYP3A4, CYP2C8, CYP2C9, CYP2C19, CYP2D6, P-gp, BCRP, and human OCT2. Isavuconazole is also a weak inducer of CYP3A4, CYP2B6, CYP2C8, and CYP2C9.12 However, in vivo drug–drug interaction studies have demonstrated isavuconazole to be a mild–moderate inhibitor of CYP3A4, a mild inducer of CYP2B6, a mild inhibitor of P-gp and UGT, and did not affect the pharmacokinetics of substrates of CYP1A2, CYP2C8, CYP2C9, CYP2C19, or CYP2D6 (see Table 3).12 Consequently, isavuconazole is contraindicated with concomitant administration of strong inducers and inhibitors of CYP3A4 such as ketoconazole, rifampin, carbamazepine, and St John’s wort (see Table 4). Similar to other triazoles, concomitant administration of isavuconazole with immunosuppressive agents (cyclosporine, tacrolimus, and sirolimus) requires potential dose reduction and more frequent monitoring of the immunosuppressive agents. Currently, there are no formal dose reduction recommendations. However, authors of a recent case report recommend an initial 50% reduction in tacrolimus dose when used in combination with isavuconazole.44 Furthermore, medications that have a narrow therapeutic window that are substrates of P-gp (eg, digoxin) require therapeutic drug monitoring (TDM) and possible dosage adjustments.12 Of note, isavuconazole is not affected by medications which alter the gastric pH, unlike itraconazole and the suspension formulation of posaconazole. Abbreviations: AUC, area under the time-concentration curve; TDM, therapeutic drug monitoring. Due to significant inter-patient and intra-patient variability in serum concentrations, serum concentration monitoring is often utilized for most triazoles (itraconazole, voriconazole, and posaconazole) for select indications.9,34,45 Similar to fluconazole, routine serum concentration monitoring is not currently required with isavuconazole. 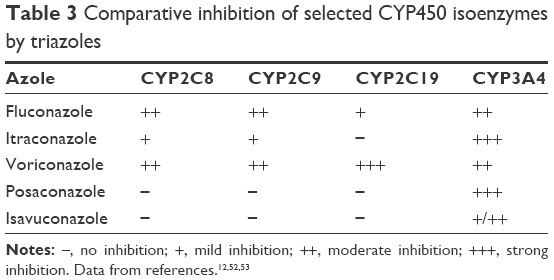 However, pharmacokinetic studies have shown that Chinese patients have a 40% lower clearance of isavuconazole compared to Western patients suggesting that CYP polymorphisms may play an important role in the metabolism of the drug.12 In addition, isavuconazole is a substrate of CYP3A4, thus inhibitors and inducers of this isoenzyme can affect the serum concentrations of isavuconazole. Considering the possibility of inter- and intra-patient variability with isavuconazole, case reports and clinical trials have reported TDM with isavuconazole.32,35,44,46,47 However, correlation between serum concentrations and adverse effects and efficacy have not been fully assessed at this time.40 Since the need for isavuconazole TDM remains unclear, further investigation is warranted. Features of isavuconazole include a broad spectrum of antifungal activity, availability of both oral and IV formulations, favorable safety profile (notably the absence of QTc prolongation), reduced drug–drug interactions (relative to voriconazole), and favorable pharmacokinetic profile. To date, isavuconazole has been evaluated for treatment of IA, mucormycosis, and candidiasis. Isavuconazole has been shown to be non-inferior to voriconazole in patients with IA.32 In addition, isavuconazole was associated with fewer adverse events and drug discontinuations. Therefore, isavuconazole can be used as alternative therapy in patients with IA who cannot tolerate voriconazole therapy due to severe adverse effects (hepatotoxicity, skin reactions, and visual disturbances) or have prolonged QTc prior to therapy or while on voriconazole therapy. Isavuconazole may also be utilized in those patients with IA who have CrCl <50 mL/min and require IV therapy since its formulation does not contain cyclodextrin. Currently, the mainstays of therapies for mucormycosis are amphotericin B formulations and posaconazole. Amphotericin B is often utilized as primary therapy for mucormycosis, while posaconazole is often used in sequence after amphotericin B therapy or as primary therapy in those patients unable to tolerate amphotericin B therapy. Isavuconazole is as effective as current primary and salvage therapy for patients with mucormycosis even though the evidence comes from a small number of patients (n=37).35 Outcomes are similar to those of amphotericin B formulations when used as primary therapy. Considering the significant adverse effects of amphotericin B formulations (most notably nephrotoxicity), the limited evidence to support posaconazole as primary therapy and the inability to use IV posaconazole in patients with reduced renal function, isavuconazole may be an invaluable option for the primary therapy of mucormycosis. In addition, isavuconazole can serve as an alternative to oral formulations of posaconazole for sequence therapy. Finally, the current evidence of isavuconazole in other IFIs, notably candidiasis, is not as robust as compared to IA and mucormycosis. The ACTIVE study did not show non-inferiority of isavuconazole to caspofungin in patients with candidemia and invasive candidiasis.30 Based on these data, it appears that echinocandins will remain as preferred initial therapy for invasive candidiasis. However, isavuconazole may be a reasonable step-down oral option in those patients who cannot receive other azoles due to tolerability or spectrum of activity limitations. IFIs, notably IA and mucormycosis, are associated with significant morbidity and mortality, especially in immunocompromised patients. Current treatment options for these dreaded infections are plagued with shortcomings. Isavuconazole is a broad-spectrum triazole with a good pharmacokinetic profile and favorable safety and drug–drug interaction profiles. Based on the current data, isavuconazole appears to be a viable alternative treatment option for patients with IA who are intolerant of voriconazole as well as those patients with mucormycosis who are not able to tolerate or fail amphotericin B or posaconazole therapy. Given the lack of “real world” clinical experience with isavuconazole, post-marketing surveillance will be important to understand the true degree of safety of this agent as well as the role of serum concentration monitoring. The authors report no conflicts of interest relevant to this work. Carrillo-Munoz AJ, Finquelievich J, Tur-Tur C, et al. Combination antifungal therapy: a strategy for the management of invasive fungal infections. Rev Esp Quimioter. 2014;27(3):141–158. Kousha M, Tadi R, Soubani AO. Pulmonary aspergillosis: a clinical review. Eur Respir Rev. 2011;20(121):156–174. Koehler P, Cornely OA. Contemporary Strategies in the Prevention and Management of Fungal Infections. Infect Dis Clin North Am. 2016;30(1):265–275. Pappas PG, Kauffman CA, Andes DR, et al. Clinical Practice Guideline for the Management of Candidiasis: 2016 Update by the Infectious Diseases Society of America. Clin Infect Dis. 2016;62(4):e1–e50. Antibiotic Resistance Threats in the United States, 2013. Centers for Disease Control and Prevention; 2014. Available from: http://www.cdc.gov/drugresistance/threat-report-2013/. Accessed April 22, 2016. Leeflang MM, Debets-Ossenkopp YJ, Wang J, et al. Galactomannan detection for invasive aspergillosis in immunocompromised patients. Cochrane Database Syst Rev. 2015;12:CD007394. Farmakiotis D, Kontoyiannis DP. Mucormycoses. Infect Dis Clin North Am. 2016;30(1):143–163. Petrikkos G, Skiada A, Lortholary O, Roilides E, Walsh TJ, Kontoyiannis DP. Epidemiology and clinical manifestations of mucormycosis. Clin Infect Dis. 2012;54 Suppl 1:S23–S34. Allen D, Wilson D, Drew R, Perfect J. Azole antifungals: 35 years of invasive fungal infection management. Expert Rev Anti Infect Ther. 2015;13(6):787–798. Walsh TJ, Anaissie EJ, Denning DW, et al. Treatment of aspergillosis: clinical practice guidelines of the Infectious Diseases Society of America. Clin Infect Dis. 2008;46(3):327–360. Marr KA, Schlamm HT, Herbrecht R, et al. Combination antifungal therapy for invasive aspergillosis: a randomized trial. Ann Intern Med. 2015;162(2):81–89. Cresemba® (isavuconazonium sulfate) [package insert]. Northbrook, IL: Astellas Pharma US, Inc.; 2015. Pfaller MA. Antifungal drug resistance: mechanisms, epidemiology, and consequences for treatment. Am J Med. 2012;125(1 Suppl):S3–S13. Pfaller MA, Rhomberg PR, Messer SA, Jones RN, Castanheira M. Isavuconazole, micafungin, and 8 comparator antifungal agents’ susceptibility profiles for common and uncommon opportunistic fungi collected in 2013: temporal analysis of antifungal drug resistance using CLSI species-specific clinical breakpoints and proposed epidemiological cutoff values. Diagn Microbiol Infect Dis. 2015;82(4):303–313. Pfaller MA, Messer SA, Rhomberg PR, Jones RN, Castanheira M. In vitro activities of isavuconazole and comparator antifungal agents tested against a global collection of opportunistic yeasts and molds. J Clin Microbiol. 2013;51(8):2608–2616. Espinel-Ingroff A, Chowdhary A, Gonzalez GM, et al. Multicenter study of isavuconazole MIC distributions and epidemiological cutoff values for Aspergillus spp. for the CLSI M38-A2 broth microdilution method. Antimicrob Agents Chemother. 2013;57(8):3823–3828. Arendrup MC, Jensen RH, Meletiadis J. In Vitro Activity of Isavuconazole and Comparators against Clinical Isolates of the Mucorales Order. Antimicrob Agents Chemother. 2015;59(12):7735–7742. Sanglard D, Coste AT. Activity of Isavuconazole and Other Azoles against Candida Clinical Isolates and Yeast Model Systems with Known Azole Resistance Mechanisms. Antimicrob Agents Chemother. 2015;60(1):229–238. Chowdhary A, Kathuria S, Randhawa HS, Gaur SN, Klaassen CH, Meis JF. Isolation of multiple-triazole-resistant Aspergillus fumigatus strains carrying the TR/L98H mutations in the cyp51A gene in India. J Antimicrob Chemother. 2012;67(2):362–366. Warn PA, Sharp A, Parmar A, Majithiya J, Denning DW, Hope WW. Pharmacokinetics and pharmacodynamics of a novel triazole, isavuconazole: mathematical modeling, importance of tissue concentrations, and impact of immune status on antifungal effect. Antimicrob Agents Chemother. 2009;53(8):3453–3461. Seyedmousavi S, Bruggemann RJ, Meis JF, Melchers WJ, Verweij PE, Mouton JW. Pharmacodynamics of isavuconazole in an Aspergillus fumigatus mouse infection model. Antimicrob Agents Chemother. 2015;59(5):2855–2866. Lepak AJ, Marchillo K, VanHecker J, Diekema D, Andes DR. Isavuconazole pharmacodynamic target determination for Candida species in an in vivo murine disseminated candidiasis model. Antimicrob Agents Chemother. 2013;57(11):5642–5648. Lepak AJ, Marchillo K, Vanhecker J, Andes DR. Isavuconazole (BAL4815) pharmacodynamic target determination in an in vivo murine model of invasive pulmonary aspergillosis against wild-type and cyp51 mutant isolates of Aspergillus fumigatus. Antimicrob Agents Chemother. 2013;57(12):6284–6289. Schmitt-Hoffmann A, Roos B, Heep M, et al. Single-ascending-dose pharmacokinetics and safety of the novel broad-spectrum antifungal triazole BAL4815 after intravenous infusions (50, 100, and 200 milligrams) and oral administrations (100, 200, and 400 milligrams) of its prodrug, BAL8557, in healthy volunteers. Antimicrob Agents Chemother. 2006;50(1):279–285. Schmitt-Hoffmann A, Roos B, Maares J, et al. Multiple-dose pharmacokinetics and safety of the new antifungal triazole BAL4815 after intravenous infusion and oral administration of its prodrug, BAL8557, in healthy volunteers. Antimicrob Agents Chemother. 2006;50(1):286–293. Schmitt-Hoffmann A, Roos B, Spickermann J, et al. Effect of mild and moderate liver disease on the pharmacokinetics of isavuconazole after intravenous and oral administration of a single dose of the prodrug BAL8557. Antimicrob Agents Chemother. 2009;53(11):4885–4890. Desai A, Schmitt-Hoffmann AH, Mujais S, Townsend R. Population Pharmacokinetics of Isavuconazole in Subjects with Mild and Moderate Hepatic Impairment. Antimicrob Agents Chemother. 2016;60(5):3025–3031. Viljoen J, Azie N, Schmitt-Hoffmann AH, Ghannoum M. A phase 2, randomized, double-blind, multicenter trial to evaluate the safety and efficacy of three dosing regimens of isavuconazole compared with fluconazole in patients with uncomplicated esophageal candidiasis. Antimicrob Agents Chemother. 2015;59(3):1671–1679. Isavuconazole (BAL8557) in the Treatment of Candidemia and Other Invasive Candida Infections. Astellas Pharma Inc. Available from: https://clinicaltrials.gov/ct2/show/NCT00413218?term=NCT00413218&rank=1. NLM identifier: NCT00413218. Accessed June 21, 2016. Astellas Pharma US, Inc. Astellas provides update on phase 3 study evaluating isavuconazole in patients with candidemia and other invasive candidal infections [news release]. Northbrook, IL: Astellas Pharma US, Inc.; 2015 [July 30]. Available from: http://newsroom.astellas.us/2015-07-30-Astellas-Provides-Update-on-Phase-3-Study-Evaluating-Isavuconazole-in-Patients-with-Candidemia-and-Other-Invasive-Candida-Infections. Accessed March 13, 2016. Reboli AC, Rotstein C, Pappas PG, et al. Anidulafungin versus fluconazole for invasive candidiasis. N Engl J Med. 2007;356(24):2472–2482. Maertens JA, Raad II, Marr KA, et al. Isavuconazole versus voriconazole for primary treatment of invasive mould disease caused by Aspergillus and other filamentous fungi (SECURE): a phase 3, randomised-controlled, non-inferiority trial. Lancet. 2016;387(10020):760–769. Slavin MA, Thursky KA. Isavuconazole: a role for the newest broad-spectrum triazole. Lancet. 2016;387(10020):726–728. Park WB, Kim NH, Kim KH, et al. The effect of therapeutic drug monitoring on safety and efficacy of voriconazole in invasive fungal infections: a randomized controlled trial. Clin Infect Dis. 2012;55(8):1080–1087. Marty FM, Ostrosky-Zeichner L, Cornely OA, et al. Isavuconazole treatment for mucormycosis: a single-arm open-label trial and case-control analysis. Lancet Infect Dis. Epub 2016 Mar 8. Kara IO, Tasova Y, Uguz A, Sahin B. Mucormycosis-associated fungal infections in patients with haematologic malignancies. Int J Clin Pract. 2009;63(1):134–139. Greenberg RN, Mullane K, van Burik JA, et al. Posaconazole as salvage therapy for zygomycosis. Antimicrob Agents Chemother. 2006;50(1):126–133. van Burik JA, Hare RS, Solomon HF, Corrado ML, Kontoyiannis DP. Posaconazole is effective as salvage therapy in zygomycosis: a retrospective summary of 91 cases. Clin Infect Dis. 2006;42(7):e61–e65. Falci DR, Pasqualotto AC. Profile of isavuconazole and its potential in the treatment of severe invasive fungal infections. Infect Drug Resist. 2013;6:163–174. Pettit NN, Carver PL. Isavuconazole: A New Option for the Management of Invasive Fungal Infections. Ann Pharmacother. 2015;49(7):825–842. Shah RR. Drug-induced QT interval shortening: potential harbinger of proarrhythmia and regulatory perspectives. Br J Pharmacol. 2010;159(1):58–69. Shah RR, Bjerregaard P, Gussak I. Drug-induced QT interval shortening: an emerging component in integrated assessment of cardiac safety of drugs. J Electrocardiol. 2010;43(5):386–389. Illnait-Zaragozi MT, Martinez GF, Curfs-Breuker I, Fernandez CM, Boekhout T, Meis JF. In Vitro activity of the new azole isavuconazole (BAL4815) compared with six other antifungal agents against 162 Cryptococcus neoformans isolates from Cuba. Antimicrob Agents Chemother. 2008;52(4):1580–1582. Kim T, Jancel T, Kumar P, Freeman AF. Drug-drug interaction between isavuconazole and tacrolimus: a case report indicating the need for tacrolimus drug-level monitoring. J Clin Pharm Ther. Epub 2015 Aug 6. Ashbee HR, Barnes RA, Johnson EM, Richardson MD, Gorton R, Hope WW. Therapeutic drug monitoring (TDM) of antifungal agents: guidelines from the British Society for Medical Mycology. J Antimicrob Chemother. 2014;69(5):1162–1176. Ervens J, Ghannoum M, Graf B, Schwartz S. Successful isavuconazole salvage therapy in a patient with invasive mucormycosis. Infection. 2014;42(2):429–432. Peixoto D, Gagne LS, Hammond SP, et al. Isavuconazole treatment of a patient with disseminated mucormycosis. J Clin Microbiol. 2014;52(3):1016–1019. Diflucan® (fluconazole) [package insert]. New York, NY: Pfizer; 2014. Vfend® (voriconazole) [package insert]. New York, NY: Pfizer; 2015. Seyedmousavi S, Verweij PE, Mouton JW. Isavuconazole, a broad-spectrum triazole for the treatment of systemic fungal diseases. Expert Rev Anti Infect Ther. 2015;13(1):9–27. Noxafil® (posaconazole) [package insert]. Whitehouse Station, NJ: Merck & Co., Inc.; 2014. Niwa T, Shiraga T, Takagi A. Effect of antifungal drugs on cytochrome P450 (CYP) 2C9, CYP2C19, and CYP3A4 activities in human liver microsomes. Biol Pharm Bull. 2005;28(9):1805–1808. Bruggemann RJ, Alffenaar JW, Blijlevens NM, et al. Clinical relevance of the pharmacokinetic interactions of azole antifungal drugs with other coadministered agents. Clin Infect Dis. 2009;48(10):1441–1458.